Two outstanding, contrasting links course and 36 wonderful holes make up one of the finest golf resorts to be found anywhere in Ireland (Ranked No. 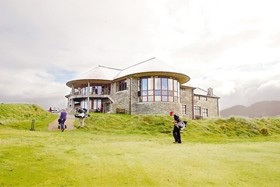 1 Golf Complex in Ireland by Golf Digest Irealnd). The Old Links natural terrain presents an immensely enjoyable challenge to every golfer. Work recently undertaken by Nick Faldo, one of Europe’s most successful golfers has resulted in an Old Links that has been refined and what is now a fantastic golf course. The Old Links hosted the European Seniors Tour in June 2008- The Irish Seniors Open. The Glashedy Links has hosted the Irish Inter-provincial Championships in 2006, the European Tour, North West of Ireland Open in 2002 and the Ladies European Tour, Ladies Irish Open in 1998. Part of the successful North West Ireland team that won European Golf Destination of the Year 2011. Visit http://www.ballyliffingolfclub.com for more information. Ballyliffin Golf Club is only a 5 minute drive from the Glen House.